As the community and Seattle officials gather Wednesday at City Hall for a public “Park Smart” forum to discuss how best to manage parking in “dense urban areas,” a group of Seattle business organizations has called for a delay in implementation of a slate of changes proposed for parking laws including paid parking being extended to 8 PM and a jump in rates in the parts of the city where parking spaces are in highest demand. In a letter from organizations including the Downtown Seattle Association, the Greater Seattle Business Association, the First Hill Improvement Association and 12 other Seattle commerce groups, representatives are requesting that the Mayor and City Council work to delay implementation of 2011 parking meter rate increases around the Seattle area. The group says its member are concerned over the effect rate increases will have on foot traffic and area businesses. We’ve attached a copy of the full letter to this post. The Capitol Hill Chamber of Commerce is not included on the roster of groups calling for the delay. We’ll follow up with the chamber to find out where they stand if the call for a delay progresses. The new rate is planned to be $3 an hour for Capitol Hill’s paid parking zones. The new hours and rates were scheduled to begin February 1st. We’ve posted maps of Capitol Hill’s parking zones here. Why these business groups engage in such transparent nonsense is beyond me. These are groups that still believe that free parking is good for business (there’s mountains of evidence that it is not the case). What do they possibly hope to accomplish with this delay? The write “on street parking spaces are critical to supporting small business”, and they’re right – it’s critical they’re not occupied by the workers and owners of said business or residents who aren’t shopping at that business. The new rates and hours make it more likely that paying customers are utilizing those spots. 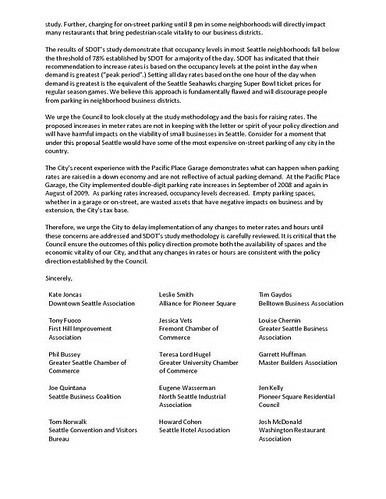 Of course, the city could send a message, and just make all parking free in Capitol Hill for a month, then these business groups might understand what parking pricing does for them. HU – as a small business owner, both downtown and on the hill, I agree with you. In fact in Belltown, where there weren’t parking meters until 2002, it’s the business owners who asked for them.